Why waste power on a geyser when you can get the hot water without one? Amazed to hear this? Yes. This is possible, says Santosh Kaveri. Santosh is a student of Belgaum and also an active LEADer of LEAD – LEADers Accelerating Development program, which provides the students a unique platform to students to bring their dream ideas into reality. He comes from an agriculture background and has faced lot of hurdles in his childhood. So the solutions to hurdles were his ideas which he wanted to bring into reality. He came up with the idea of an instrument which can give hot water without an electric or a gas geyser! He took a copper coil and connected two metal pipes at the two ends of the coil. 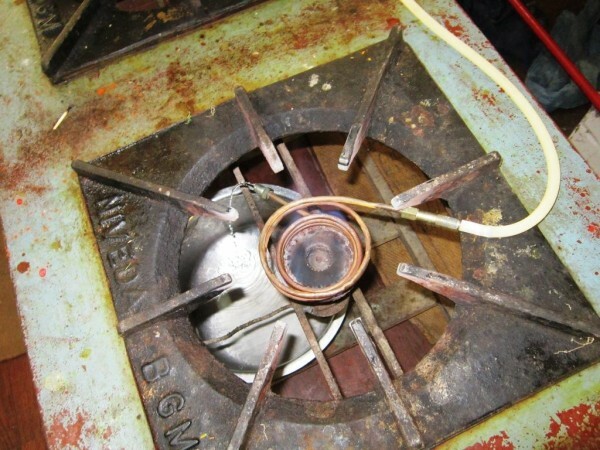 He fixed this instrument to a gas stove in his hostel for experimenting. And he was successful in getting hot water within seconds. Normal water flows from an inlet and the hot water goes out through the outlet at the other end. The instrument can be used for any kind of stove. The cook in the hostel is happy for Santosh’s idea, as this instrument is helping them reduce a cost of about more than a thousand rupees per month and also is helping them in reducing the energy consumption. 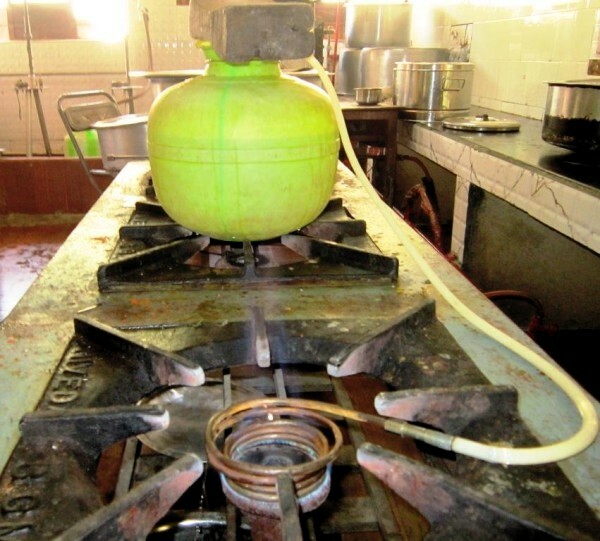 Earlier 6 gas cylinders were used in the hostel, one separately for just boiling the water to prepare rice. But now there is no need of using a separate one for boiling water as this instrument can give hot water from the gas stove within seconds. It is also helping in saving time required for cooking. Sanotsh is planning to take this idea of his on a larger scale. That is he is thinking to implement this idea in the surrounding places of his hostel like other government hostels, homes and other places and help many other people. He is a proud LEADer and is thankful to LEAD for providing him a platform to implement his idea. There will be more efficency if the diameter of the copper Coil which is placed on the stove is 50% of the inlet and outlet pipe. I partially agree with Mr. Abhilash. In a conventional gas stove, heat loss is always there. And from the way the coil wraps around the flames, it could be that this wasted heat is captured to heat the water and still retain the heat required for cooking. Even if 100% may not be achieved, but it could go a long in phenomenal increase in fuel efficiency and thus reduce cost. Santosh , I appreciate you and your hardwork , well this is not to discourage you but I just wanted to say that This system is eventually an Gas Gyeser and Enegry is not getting saved in this process.Earlier the Food in the vessel used energy produced(to be specific “converted”) ,now the energy is being used by water in the pipe and food in the vessel in some proportion/ Ratio. I Hope I am clear. I agree with Abhilash. The copper coil might be a convenience, but from the article it doesn’t sound like it will be an efficient way of heating water. One idea could be to harness solar or other alternative forms of energy. Great work Santosh. I think this is better than your earlier innovation. Congrats. for any type of help please revert.